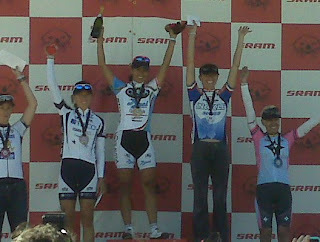 Race Report-Torrance - By Pam Schuster! 20-30 women. Continuous fast pace. I had the usual plan to make a break, get in a break, be in a break or bridge to a break. Half-way through the race I thought to myself that I should have asked Helen's for a combine since their plan was to gang up on me. Oh yeah, they even told me this before the race and I was scared. Nothing was getting away though. Helens set up a lead out with 3-4 laps to go(for Maria), mixing it up with SBDC....which is like 1-2 laps to go on a more common course The course was a short 0.4 mile 4 corner loop. I knew I wanted to Jump 2 corners before the finish which I did, jumped again before the last corner and again for the finish and held to the line for the win just an old lady hair in front of Suzanne Sonya...not sure who was after that. Of course there was a crash on the final lap. No one hurt. I won a preem that I don't know how to use but I want to give to my team before our next race because I know they will know how to use it. Remind me! Dotsie Bausch of team Incycle/Time to Track presented by Empower Coaching Systems took 2nd place in the Sea Otter Classic road race this afternoon. Bausch was part of a six-rider selection that got off the front on the fourth of six laps of the hilly circuit around Fort Ord on the Monterey Peninsula. The stage placings were essentially determined by who had the best climbing legs at the end, as the circuit finished with a 2.5-mile climb. Carmen Small (Colavita-Baci) put in the late attack that got the stage win. Rebecca Much (Team Tibco) stayed with Dotsie Bausch (InCycle/Time to Track) until the final 200 meters but had to settle for 3rd. The Incycle girls were all present in the first half of the race with Steph Roorda and Bea Rodriguez following all of the early moves. Katie Donovan and Bausch were able to slide on to dangerous moves in the second half of the race, sticking on the wheels of the dangerous climbers, which eventually led to the final selection. "The team was awesome," said Bausch. "I just get so inspired by them and if I am the one in the break, I want to win for them. We have a great thing going with this team." Dana Point Killer Cove Time Trial! Dotsie Bausch and Bonnie Breeze in action. Took 2nd and 3rd on the day for Incycle/Time to Track presented by Empower Coaching Systems! This year was not an NRC event, so the field size was expected to be smaller and less aggressive then last year. Although the field size was smaller, with all the local teams in attendance, the race started and stayed fast almost the entire time. Attacks and counters were going the whole time. There were lots of primes keeping the pace high too. The teams with sprinters wanted things to stay together. Team NOW, Vanderkitten, Paramount and Helens were out in full force. Our team was short two riders, which would have been a big help considering the aggressive racing…The last lap was fast with Bonnie starting the lead out and Pam taking the next pull. Strong headwind going into the last turn certainly wore out the leadout and Bea had to fend for herself. The last turn had a crash, taking out a handful of racers. Kendall Ryan from NOW won the field sprint, Maria Lechuga got 2nd and Coryn Rivera fromthe peanut butter team picking up 3rd. Bea made it throught they mayham for 10th. Happy Easter! The race is a key race for our sponsor, INCycle. They provide race primes and they offer up a bike frame to the series winner. This particular event also conflicts with a CBR race only an hour south. We knew the fields would be diluted for both events based on the close start times. (Yes, we would have driven down south after to make the other race!). The key teams that showed was paramount and SDBC with three racers each. We had almost the full team out with the exception of PC and Steph. We attacked on regular intervals to try and create a break away. Everyone was very aggressive in trying to keep things together from the field. Pam was the first to break away with Kelli Jones from SDBC. Bea later bridged up to the break clean. The field started to chase and got very close to the break. At this point Hillary Crowley from Paramount bridged to the break and later our Katie Donovan made it to the break. The break was now bound to stay away with little motivation from the field. Coming into the final lap, Lea attacked the field and Dotsie countered on the catch to stay away and sweep up 6th place. Bea won the race! followed by Hillary from Paramount, Pam, Katie and Kelli from SDBC.